A stray puppy from Romania is lucky to be alive today. The dog was very close to getting hit by a speeding car when his canine street companion – a larger, older and wiser dog – grabbed a hold of the puppy’s tail and pulled him out of harm’s way. Both dogs were attempting to cross the road but the puppy stepped on the road and failed to look out for incoming traffic. Two cars were approaching the dogs and the car closest to the pets had no intentions of slowing down, nor could it swerve to avoid hitting the pet. 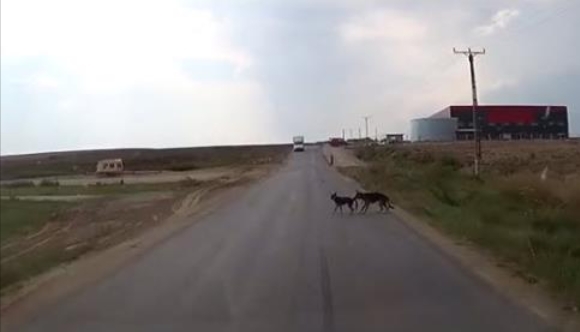 The driver of the car used his horn to try to spook the dogs and force them to get off the road, but even this did not deter the puppy from continuing his path. The heroic act of the larger canine was capture by the dash cam of the speeding car and the video was uploaded to YouTube. Even though we wish all homeless dog found a safe home, the reality is thousands (if not millions) of pets are exposed to street life and its dangers on a daily basis. At least it comforts us to know that in a dog pack, the leader, older and wiser dog, is always looking out for his or her pack members. Thanks to this canine act of kindness the puppy’s life was spared. Responses to "Dog Bites Puppy’s Tail to Save Him From Speeding Car"
And some human's think that canine's are dumn , don't think , and don't love and don't have feeling's. this proves them wrong . Dog's and wolves and all god's creatures are awesome ! Let good reign and Evil go to hell were it belongs .